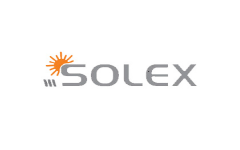 Business description - Solex Energy is engaged in providing renewable energy solutions, specialized in the manufacturing of Solar photovoltaic module, solar home light, solar street light, solar lantern, solar power plant, solar invertors, solar water heating systems and wood fired water heater etc. The company provides the offered appliances in numerous specifications and customization in accordance with the demands of customers. Its manufacturing facility is situated in Anand, Gujarat. Solex Energy’s product ranges from Solar PV Module (3WP - 325 WP), Solar Lanterns (CFL & LED Base), Solar Home Light System (CFL & LED Base), Solar Street Light System (CFL & LED Base), Solar Off-Grid Power Plant (Solar Rooftop Systems), Solar Grid Connected Power Plant, Solar Water Heater Flat Plant Collector, Solar Water Heater ETC Type, Solar Submersible Pump (AC & DC), Solar Surface Pump (DC). We also provide solution for solar roof top system, solar home and rural lighting system, solar power pack and solar power plant. Solex Energy IPO allotment status is now available on Skyline Financial Services' website. Click on this link to get allotment status. Naveen is right. Most of SME companies are nothing more than scams. It looks like everyone and anyone is coming up with offers and their quality is very poor. What kind if value a 19 year old fresher brings??? I am little doubtful for this Industry, earlier companies had made hole in my pocket. Better avoid.